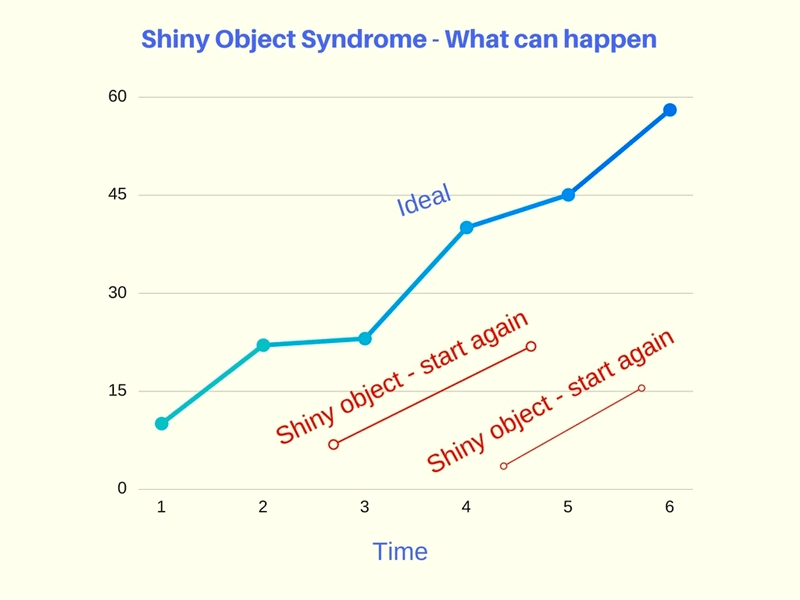 Have you heard of the Shiny Object Syndrome? It is the tendency for someone to chase something new — be it a new business idea, tool, or goal — rather than stay focused on what they’re doing. It is similar to a child who is attracted to anything that’s shiny and new. I have a nephew who is 18 months old, and he is constantly attracted to anything that moves or emits sound. As a child approaches a new object that he’s never seen, he’s intrigued at first, but quickly loses interest as the item loses its appeal. He’s then attracted to the next new shiny thing, only to lose interest and seek the next new shiny object! You have a list of business ideas but nothing gets executed. You constantly start new goals but never see them through to the end. You jump from one internet course to another, drawn by the wild claims of each course. You frequently jump from one goal to the next rather than sticking with what you’re doing to the end. You keep registering new domain names, even launching new websites, but you never work on building those sites. You have a collection of plugins and tools, but you don’t actually use them. At the heart of it, the issue with the shiny object syndrome is distraction. Being constantly drawn to new ideas and tools, and abandoning important tasks in the process. You never get things done. That’s because you’re always on to something new, rather than completing your current plans. You spend too much time on new ideas and fancy tools, of which 95% are noise, rather than building the fundamentals. You become a jack of all trades, master of none. That’s because you don’t spend enough time to become good at something. There is a difference between a Beginner vs. Intermediate vs. Veteran vs. Expert, and you spend too much time being a Beginner since you’re switching focus and learning things from scratch all the time. This is different from the talent stack, which means being good enough in a variety of skills, hence giving you an edge over others. Because you never get good enough at something, you never reap the market leader rewards. The market leader effect is the phenomenon where the winner takes all. Most people will only ever know the top leaders in each industry, and hence market leaders often enjoy a huge lead in market share over everyone else. When you’re constantly chasing new things, you spend too much time learning the basics of each tool, each skill, rather than building on your skills. This causes you to miss out on market leader gains. 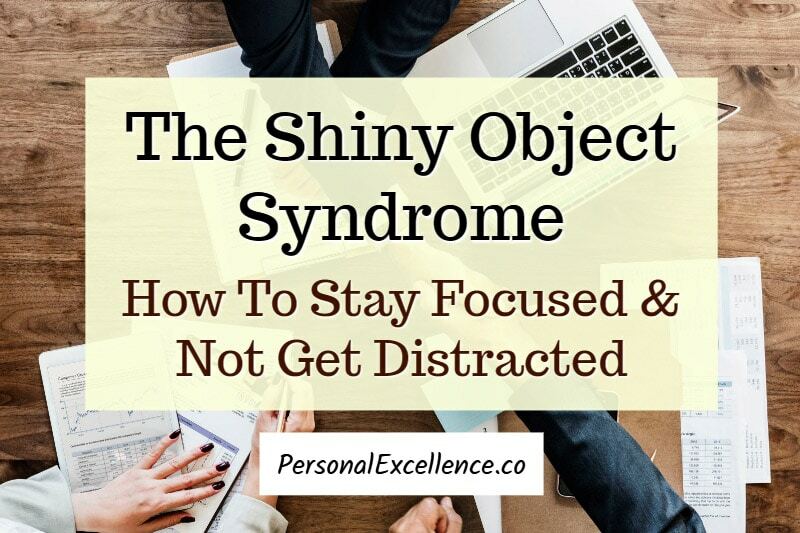 So how can you stay focused and avoid the shiny object syndrome? Understand that new does not mean better. To be clear, addressing the shiny object syndrome is not about ignoring every new thing. In today’s world, it is important to keep in touch with the latest trends and updates. However, when all you do is follow every new tool and idea, you waste your time chasing trends rather than getting things done. Understand that new doesn’t mean better. Just because a company just launched something new doesn’t automatically mean that it’s better. Learn to see past the hype. There are constantly new, shiny objects in the online world. New startups, new products, new services. On social media, seeing raving reviews creates a mob mentality where you feel the need to jump in and follow what others are doing. But see past the hype. While people may brag about how great a product/service is, what’s good for others may not be good for you. Even though a company can promise the world on what their product can do, many startups, ideas come with birthing pains and issues. Rather than jump headfirst into something, question how it fits in with your priorities. Is this what I really need? Will it add value to my work and life? What are the pros vs. the cons of doing this? Only do something if it’s what you need and it adds genuine value to your work and life. Just because others are doing something doesn’t mean you have to. Improve your signal-to-noise ratio. The best way to manage distraction is not through discipline, but by managing the sources of distraction. When you are part of groups and newsletters that keep recommending new products, new offerings, it disrupts your focus and train of thought. You have to deal with the mental load of looking up each recommendation, assessing if it’s good for you, and making a decision about it. This is known as cognitive load, something that I mentioned in my How to Say No podcast. Instead of sieving out noise which takes up precious mental energy, remove low-quality information sources. Evaluate your social media news feeds, Facebook group memberships, email subscriptions, and RSS feed subscriptions. What is your noise-to-signal ratio for each channel? Noise refers to information that’s irrelevant to you, while signal refers to information that’s useful and relevant. A high noise-to-signal ratio means the channel has a high proportion of unhelpful, irrelevant suggestions (noise) vs. helpful suggestions (signal). Unsubscribe from groups and newsletters with a high noise-to-signal ratio. Get your information from sources with a high signal-to-noise ratio instead. Understand the concept of switching costs. Even though there are new tools released all the time, I only look into a new tool when (a) it has something that my current tools can’t provide, and/or (b) there are very strong reviews from multiple sources. Otherwise, I simply take a cursory glance at what’s available and return to my work priorities. One reason is that when you shop even though you don’t need anything, you’re invariably going to end up buying something. The second reason is switching costs, which are invisible costs incurred as a result of switching to something new. Switching costs can be monetary. They can be the time taken to learn a brand new system. They can also be the mental cost of changing your focus. When you keep switching to new ideas, new projects, and new tools, you are just incurring switching costs all day long and getting nothing done. Always factor such costs in when you are enticed by a new idea or tool. Adopt a “wait and see” approach. When you’re unsure, it helps to adopt a “wait and see” approach. With rapid technological changes today, many tools tend to become obsolete after a couple of years. For example, many WordPress plugins are no longer supported or have died out. Products that claim to be the best often get replaced by better products one to two years later. My personal approach when I feel 50/50 about something is to wait and see. If it’s a new tool, I take the chance to look at the company’s background, preview the tool, and assess if I really need it. For new online tools, there are often integration issues and unknown bugs, and it can be costly to be an early adopter if you already have a live business with customers. Unless this is something that I need to use now and I have no other alternative, I find that “waiting and seeing” a much more prudent approach. Differentiate between shiny objects and real opportunities. Last but not least, learn to differentiate between shiny objects and real opportunities. Shiny objects are things that look good and exciting, but are really distractions at the end of the day. There are many new products these days that look promising but don’t add value to your work and life. By the time you are done with it, you realize you have no need for that tool — after which you get distracted by another shiny object. Keep a watch out for real opportunities — and be ruthless in saying no to shiny objects. Real opportunities make a real impact in your work. For example, tools that dramatically improve your workflow. Tools that help you grow your business. Tools that help you better engage with customers. Tools that help you deliver better products and services.